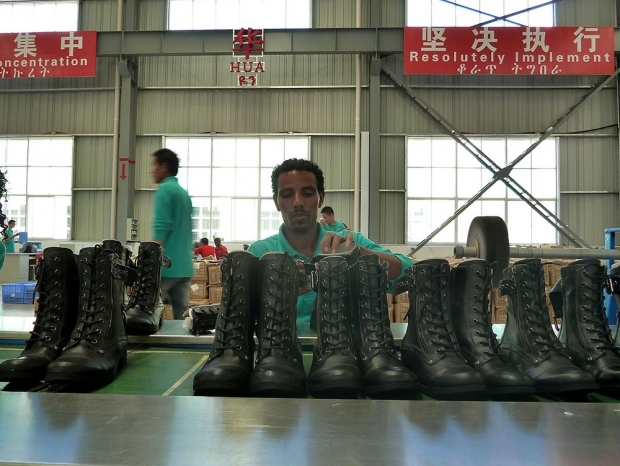 A worker laces up boots on the assembly line at the Huajian shoe factory in Dukem, Ethiopia in 2012. Huajian is a Chinese factory operating in the Chinese-built Eastern Industry Zone—Ethiopia’s first industrial park. A growing number of Chinese companies are looking to outsource production overseas in a bid to lower costs and meet Beijing’s increasingly stringent environmental laws. Ethiopia and South Africa are among the beneficiaries of this new trend as Chinese apparel, textile, and even steel companies move their production offshore. However, the outsourcing of Chinese manufacturing to Africa presents both opportunities and challenges. It will no doubt lead to increased employment, investment, and economic growth, but in countries with lax labor and environmental laws there is the likelihood of abuse. Eric and Cobus review the pros and cons of the Chinese outsourcing trend in Africa.